Update (7/3/2018): On July 2, a federal court blocked the Trump administration's arbitrary detention of asylum seekers fleeing persecution, torture, or death. You spoke up for asylum seekers across the country and it made a difference. The court's decision makes it clear that the Trump administration cannot use detention as a weapon to punish or deter people from seeking refuge. Now take the next step – call your senators to fight the Trump anti-immigrant agenda. 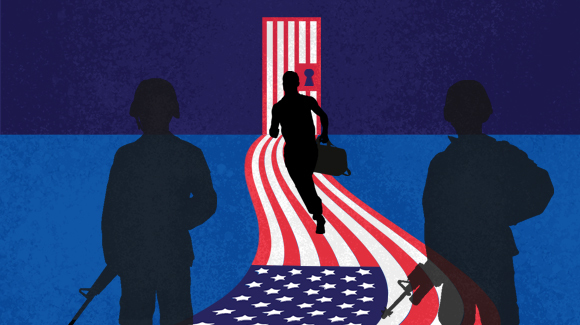 The ACLU and partners have filed a class action lawsuit against the Trump administration’s cruel and unconstitutional practice of locking up asylum seekers without due process. The nine plaintiffs in the case are all fleeing persecution, torture, or death in their countries of origin. They passed government screenings and were found to have strong claims for asylum which should be heard in court. But against all standards of decency – and constitutionality – Trump has locked them up. Indefinitely. The detention of asylum seekers is not only cruel and wasteful – it’s illegal. It violates the Constitution, U.S. law, international law, and the Department of Homeland Security’s own written policy. Yet again, the Trump administration has crossed the line in effort to push its hateful, anti-immigrant agenda. Immigration lawyers will use this petition to support these cases. There are many more lives at stake than these nine plaintiffs – it’s estimated that in 2017 more than a thousand asylum seekers were locked up under the administration’s detention practices in jails throughout the country. If enough people sign the petition, we’ll give asylum seekers better chances of winning their freedom – and we’ll force U.S. immigration policy to follow our constitutional principles. This cruel pattern goes against Homeland Security's own policy, which requires ICE to grant asylum seekers “humanitarian parole” and release them from immigration detention, provided they meet a series of stringent requirements. The directive is still in place, but it’s grossly violated each time ICE throws an asylum seeker who’s met those requirements behind bars. One of our clients is Ansly Damus, a former teacher who poses no danger to anyone. When he fled political persecution and targeted violence in Haiti, he thought he’d find safety in the U.S. But ICE continues to lock him up, even though he has been granted asylum twice by an immigration judge. Ansly has no access to the outdoors, the internet, or email. With this unconstitutional practice, the Trump administration wants to send a clear and cruel message: Asylum seekers need not apply – seek safety elsewhere. Sign this petition to tell the Department of Homeland Security to stop the illegal detention of asylum seekers. Stop the illegal detention of asylum seekers without due process. This practice violates the policies of your own department, as well as U.S. immigration law, international law, and the Constitution.